PLAYBAR's built-in sensors will automatically orient the audio channels and adjust the EQs for the perfect sound. PLAYBAR is scalable. You can add a SUB or even two PLAY:3s for a 5.1 experience at the touch of a button without the need for messy wiring or complex audio set-up. Unlike most soundbar systems, PLAYBAR learns your remote signals and so lets you use your existing remote without change. This could be SKY, Virgin or any other IR remote. PLAYBAR is sensitive. Sonos thought of you late-night movie-watchers. 'Night Sound' dynamically compresses the audio to avoid any bangs and crashes waking the family, while making quieter sounds more audible. 'Speech Enhancement' boosts the frequency range of the human voice so you never miss those essential moments of dialogue. Whether you're watching your favorite movie, catching up the latest TV series, gaming with your friends or having a full-on dance party, Sonos has you covered. 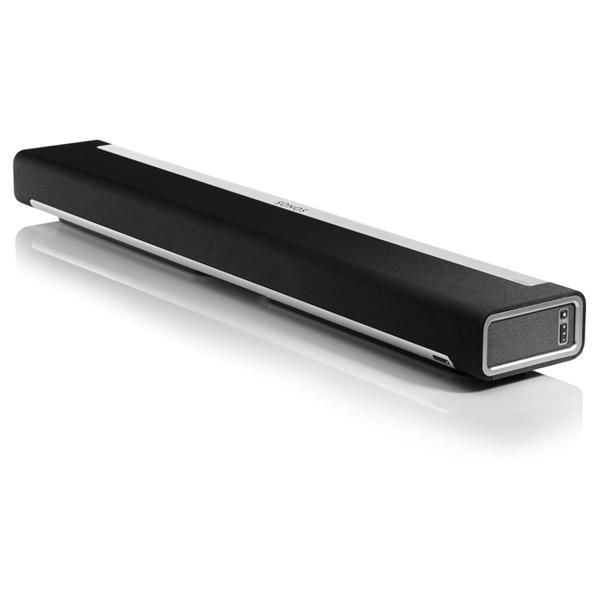 PLAYBAR is the soundbar for music lovers. Please note that this product is shipped directly by the UK supplier so delivery will not necessarily be on a Next Working Day basis.